With the advent of lasers that can literally cut into your eye and fix your vision, coinciding neatly with the progression of the contact lens into what it’s become, “Rec Specs” have basically been made obsolete except for at select racquetball courts/Men’s Clubs across the country, where accountants and lawyers duel to the death. Hahaha, just kidding- no one reading this is old enough to even remember this dude. But perched amongst the top of his humongous melon were a pair of glasses that were the precursor to all “Rec Specs” thereafter. They may have been just a pair of glasses with some duct tape keeping them in position, but they spawned an entire generation from their loins. Not only were these guys twins with the same type of overall game, but they both had the same terrible vision. Harvey Grant, who toiled for years on bad Washington Bullets and Portland Trailblazer teams, was the “Ying” to Horace’s “Yang”. Horace enjoyed a ridiculous amount of success as he progressed from being a key cog on several Bulls championship teams and eventually a LA Lakers squad. One thing that also progressed was his eyewear. Not only did it always match the squad he played for but it went from the old school “Rec Specs” to the newer, evolved version that Amare Stoudamire wears in present day. 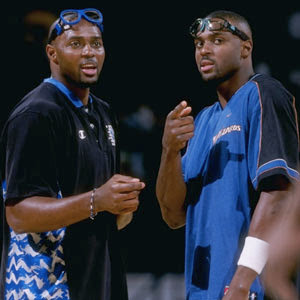 Outlaw popularized the glasses that Stoudamire currently wears thanks to his tireless defensive and rebounding ability, coupled with absolutely no offensive skill whatsoever. That is all. The original “Big Dog” (sorry Glen Robinson) Carr was also a hardworking player that was more productive than you remember. He was constant electricity in a 6-8 bottle and he always looked like he was ready to fight- gotta love that. Buck Williams was the ultimate hard working, underappreciated, yet productive player most NBA fans don’t remember. Williams did all the selfless things that allowed the star laden Trailblazers teams of the 90’s to be as successful as it was. Even if you had never seen Buck Williams play for a minute of your life, if you took one look at him for one second, the glasses signified what he was all about. 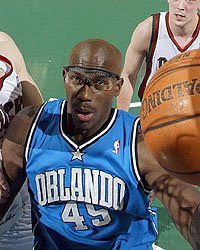 Who was your favorite NBA player to wear “Rec Specs”? And don’t say James Worthy because that is way too easy, and frankly, I expect more from you.